Black Omega is a comprehensive and high quality music player designed for Windows and Mac computers that will render your entire music library at bit perfect resolution. The program benefits from more than 14 years of research and development, offering improved and fine tuned decoders and output pathways that will deliver a top-notch quality audio stream. Black Omega is an ideal solutions for audiophiles and for those who invest in purchasing high-end speakers, DACs and amplifiers. The program will offer a playback of maximum 192kHz and 24-bit depth and supports 7.1 surround. 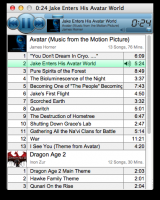 It can be easily integrated with your iTunes database in order to provide seamless playback. Black Omega also supports ASIO interface on Windows computers and integrates a series of custom encoders for various formats, such as WAV, OGG, AAC, FLAC and MP3. Has an intuitive and complete interface. Supports 5.1 and 7.1 surround setups. Black Omega has been tested by Download82.com team against viruses, spyware, adware, trojan, backdoors and was found to be 100% clean. Our editors will recheck this software periodically to assure that it remains clean.